I wonder why they say it’s going to be hilarious. It’s not so far. But I also found the Behind the Scenes video and it’s funnier. I liked their Mrs. Bennet though. Yes, she’s out of character, but at least I like her and can sympathise with her. She’s also the only character that made me laugh (once!). I disliked the scenes with Amanda knocking on the door to her apartment. They’re so designed on sucking our sympathy for the poor Amanda locked in the Regency world by the naughty Lizzy! Of course we’d hate her if the situation was opposite and it were Lizzy begging to be let in, while Amanda kept her out. It makes no sense either. Lizzy wouldn’t behave like that, not to mention that she’d return if she heard that Jane had troubles. Also, there’s no reason for Lizzy to keep Amanda locked in. She might still remain in the modern world if Amanda returned, and Lizzy isn’t a person to freely dispose of the life of others for her own amusement. Come on! Last time I behaved like that I was 10. Their Lizzy proves to be sillier than Lydia. They said that Amanda would change the events, but otherwise they’d be faithful to the book and its characters. They failed on both accounts. Some events – Bingley’s meeting the girls before the Meryton Assembly or the Netherfield party’s presence in Hertfordshire on the preceding Sunday are the producers’ changes and have nothing to do with either Amanda’s presence or Austen’s book. The characters are out of character, and it only shows that Andrews didn’t read the book carefully enough. If you write fanfiction, do it intelligently. I’m afraid that I don’t like Amanda. She’s not a girl I’d befriend in RL. Even today there are women who have more subtlety, are intelligent and eloquent. She lacks it all. Let’s face it: How silly one must be to identify with Amanda? And why on earth did she run to Netherfield? She read the book, so she knows Jane’s going to be fine. As my friend noticed, Amanda seems pretty dumb like for such an Austen lover. She reads the novel daily, and yet she hasn’t learnt that one doesn’t address Miss Bingley ‘Caroline’ or her brother ‘Charles’. 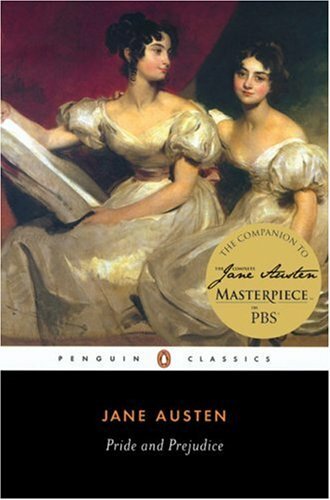 I might like a parody of P&P, if, say, Rowan Atkinson played Mr. Darcy, but Lost in Austen is a poor melodrama. All we know of Elizabeth is that she is in modern Hammersmith and doesn’t seem keen to come back. I half expect she will eventually turn up 3 months pregnant and high on drugs. It is a truth universally acknowledged that ITV commissioning editors are absolutely desperate to get a big ratings hit, so they must have been as giddy as a Regency spinster approaching 30 when they first saw Lost in Austen galloping over the horizon. What was utterly unconvincing was Amanda hurling her last cigarette away after just two puffs when she’s stuck in the 18th century and unlikely to get her paws on another packet for another 100 years or so. Modern-day female gets transported back in time to become the heroine of a Jane Austen novel? Isn’t that what we used to call “an Andrew Davies adaptation”? Glad you found my blog and like the fag gag. I think you’ve hit the nail on the head – Lost in Austen just isn’t quite good enough. But I also like Mrs Bennett played by Alex Kingston, though she probably owes a lot to Alison Steadman’s performance in the role. Lucy and Pete, thank you both for your comments! No, the series is not that good really. I think it might be better if they didn’t try that hard to make their Amanda – Mary Sue likeable. If she just decided from start that she’s going to get Darcy we might watch, with a dose of amusement, how she uses to book to her advantage. On the other hand, if she were not to be a romantic lead the producers might focus on developing various time travel ideas instead of using them just to justify Amanda’s taking Lizzy’s place. I was under the impression that the door couldn’t be opened, not that Lizzie wouldn’t open it, but perhaps I just made that up myself… it’s not like the program gave us any real information about the portal anyway. As for Amanda running to Netherfield, I’m almost hoping that Jane dies from the cold next episode and then Amanda feels really terrible for being SUCH A MORON about everything, it’d serve her right. I’m afraid Jane’s fate will be worse than that, but it certainly won’t stop Amanda. Yes, it’s not clear, but from the way Lizzy didn’t respond to Amanda but only slipped the letter it seems that she has fun. Anyway, it does seem strange that Amanda won’t ask Mr. Bennet to open the door. After all it’s just a wooden panel. If one can slip a letter through the crack, Amanda could slip out through a larger hole.